Distinctive for its black and white diamond pattern, the Cape Lookout Lighthouse is the southernmost lighthouse that guards the Outer Banks, and is easily one of the most visited attractions on the refreshingly desolate Cape Lookout National Seashore. Accessible only by a privately owned boat or ferry, the lighthouse may be a little hard to reach, but the ensuing landscape is well worth the trip. 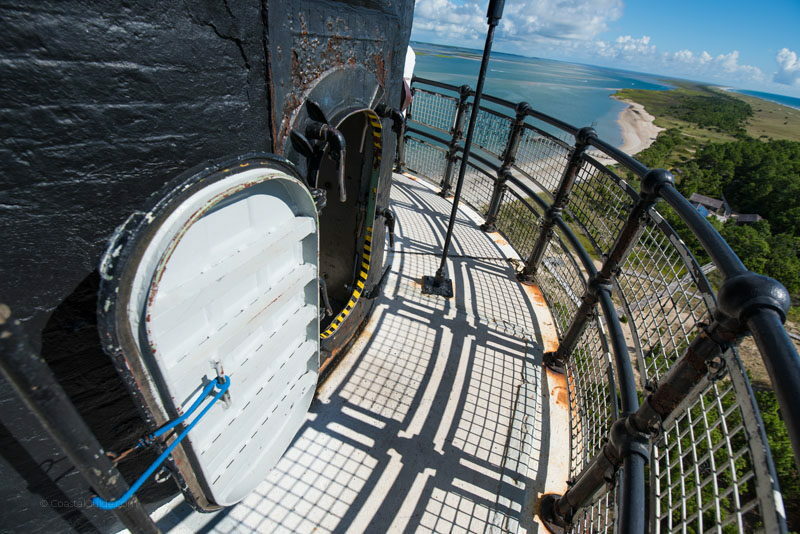 With beautifully undeveloped beaches in every direction, and panoramic views from the top of the 163’ ft. structure, planning a visit to the Cape Lookout Lighthouse is a Crystal Coast adventure that visitors won’t soon forget. The current lighthouse was built in the late 1850s, and is the second lighthouse to stand at this isolated spot along the National Seashore. Replacing an 1812 lighthouse that only extended 96’ ft. tall and was therefore ineffective for mariners well offshore, this “new” 1859 structure reached 163’ ft. into the sky, and was outfitted with a first-order Fresnel lens which allowed the beacon to illuminate the region. 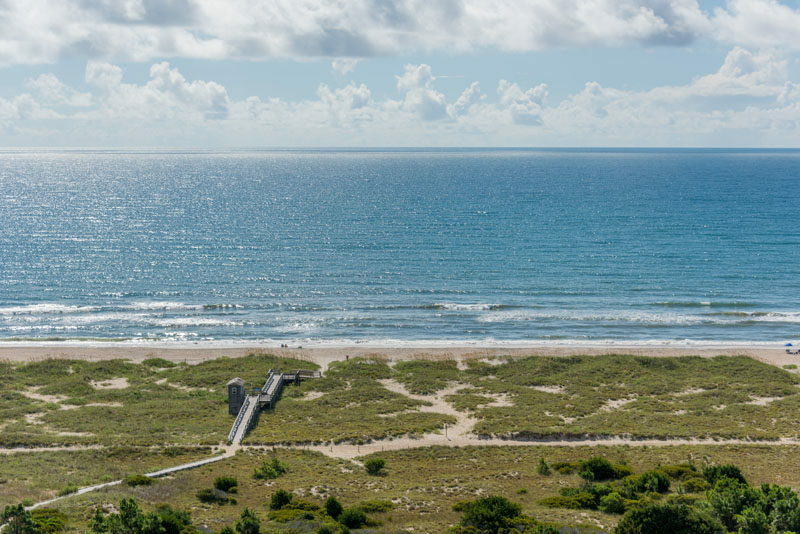 The ensuing 12-19 mile range of the light was essential, as Cape Lookout is adjacent to shifting sandbars and massive currents, and as a result, serves as the final resting place for centuries of shipwrecks. One of the reasons for the delay in the painting was the onset of the Civil War, which nearly destroyed the lighthouse in its entirety. After Union Troops took over the closest towns of Beaufort and Morehead City in 1862, the lighthouse became their property. In 1864, Confederate soldiers tried to destroy the structure by sneaking on to the isolated beaches, however this attempt to turn the lighthouse into ruins was unsuccessful. (The operation did severely damage the lighthouse’s staircase and its oil supply, however.) 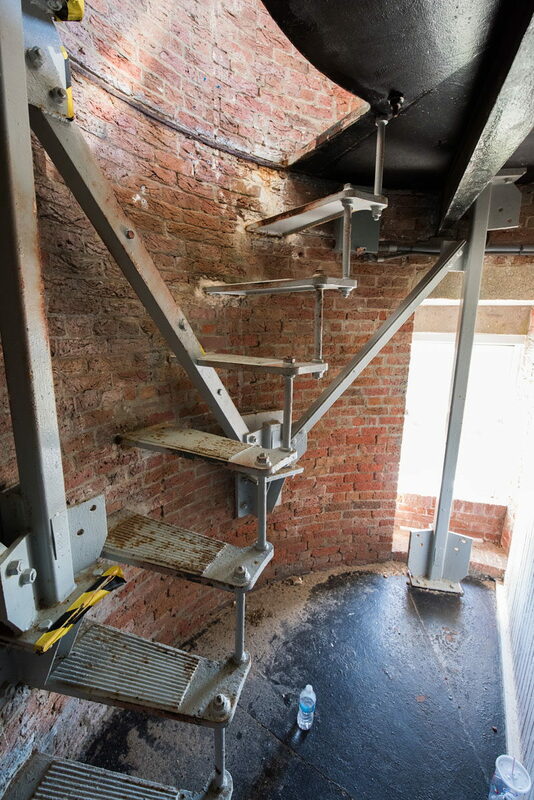 Regardless, after the war ended, the moderately-damaged lighthouse was returned to its former glory, and a better-performing iron staircase was installed to replace the original wooden one. The lighthouse served the coastline admirably for nearly a century until it was automated in 1950, and eventually converted into a popular attraction within the Cape Lookout National Seashore. 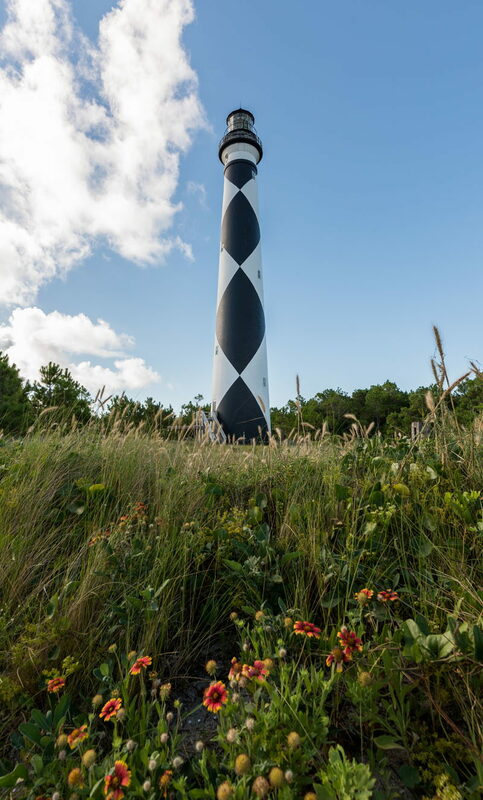 The hardest part of visiting the Cape Lookout Lighthouse is simply getting there, but thankfully there are a number of options for reaching the site throughout the Crystal Coast. Several passenger ferries regularly depart for the lighthouse from the towns of Beaufort and Harker’s Island, and there are also several privately-owned vehicular ferries that leave from the small northern towns of Davis and / or Atlantic on Cedar Island. Prices vary for ferry transportation, and reservations should be made well in advance – especially in the prime summer season. Depending on your departure point, once you’re on board, it’s a scenic 20-45 minute cruise across the Back Sound or Core Sound to reach the Cape Lookout barrier island shoreline, and from there, visitors can easily follow the paths and boardwalks to reach the primary National Park Service’s (NPS) visitors center and the Cape Lookout Lighthouse site. 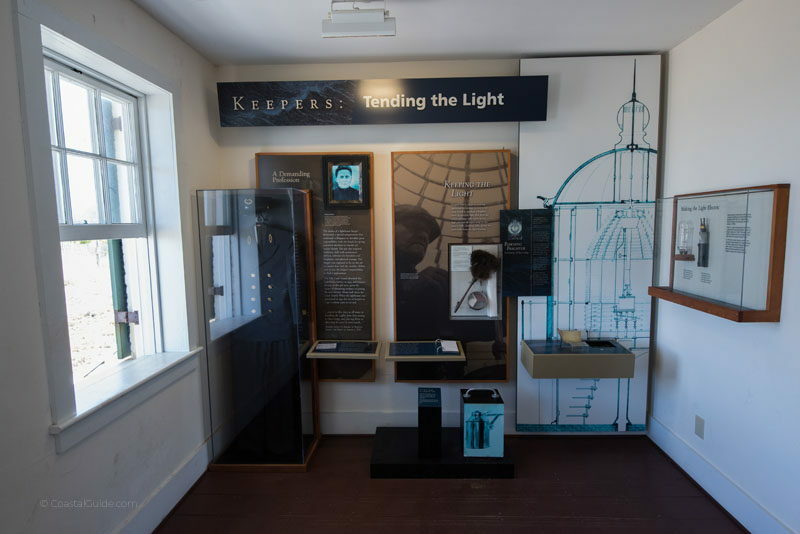 The original keeper’s quarters on the island has been converted to a small museum, and NPS rangers are generally on-site to answer questions about the lighthouse, and the surrounding beaches as well. The lighthouse is also seasonably open for climbers, typically from mid-May until mid-September, from about 9:00 a.m. until 4:00 p.m. There is a small fee to climb the lighthouse, (generally around $8.00 for adults and $4.00 for kids), but visitors who make the trek up the 207 steps to the top will be rewarded with incredible views that encompass the mainland, the open ocean waters, and everything in between. 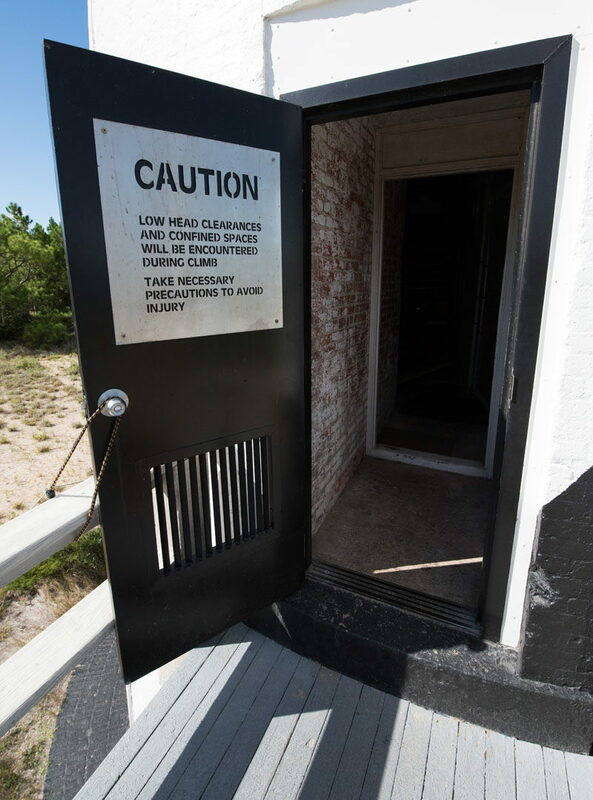 Visitors should also note that children should be at least 44” tall to climb the lighthouse, due to strong winds, and climbers who are 12 years old or younger must be accompanied by someone who is 16 years old or older. Also, shoes are required, and flip flops – although comfortable for the beach – are not recommended to make the trip to the top. 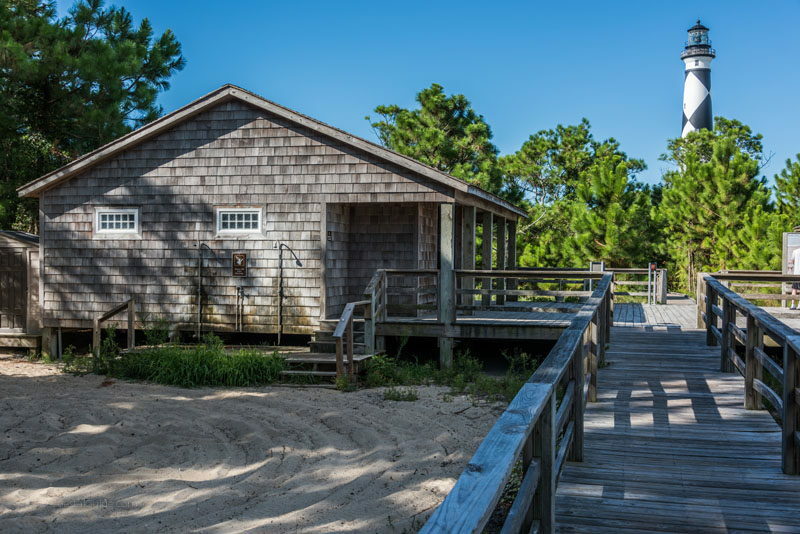 The facilities along the Cape Lookout National Seashore are limited to say the least. There are restrooms and water fountains close to the lighthouse, but not much else. As a result, visitors will want to bring along snacks, sunscreen, and especially big spray. If you go, make sure and reserve plenty of time to explore the nearby beaches! The Cape Lookout National Seashore is famous for its incredible fishing and shelling, and it’s definitely worth it to stick around and explore the shoreline. There is a “taxi service” of sorts once you arrive on the island that will take you to the best shelling and fishing beaches, (which are located around the point, or roughly a mile or two away from the passenger ferry docks.) The ride costs a little extra, but is a uniquely engaging way to explore the seashore in depth, as it passes old homes and communities, as well as miles of pretty shoreline. Want to stay longer? 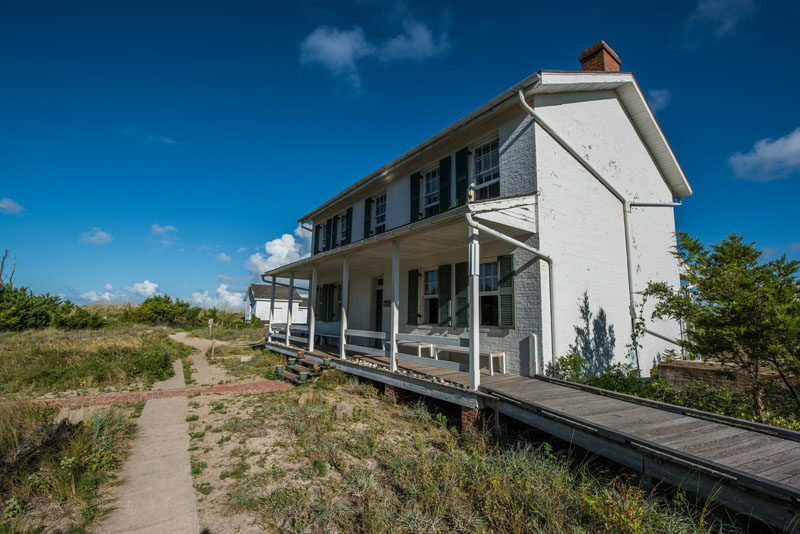 The National Park Service manages a handful of rustic beach homes within the Cape Hatteras National Seashore. 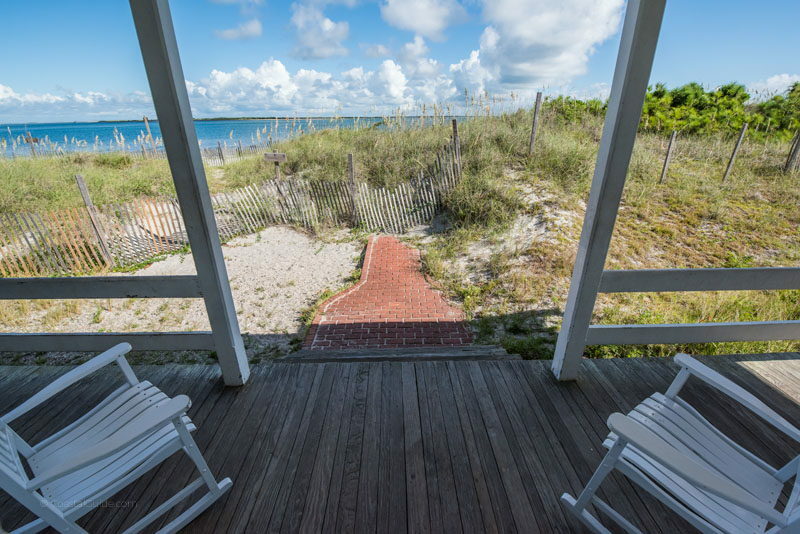 With amenities that can include A/C, handicapped accessible facilities, and stunning beach views, these properties are a viable option for visitors who want to explore the miles of shoreline in-depth. The Cape Lookout Lighthouse might be hard to reach, but it’s certainly one of the most scenic lighthouses along the Southern Outer Banks. Surrounded by pristine beaches and miles of empty shoreline, history buffs, nature fans, and anyone with an adventurous spirit will feel right at home at this iconic Crystal Coast destination. Where is the Cape Lookout Lighthouse? The Cape Lookout Lighthouse is appropriately located on the Cape Lookout National Seashore, which is a string of barrier islands off the coast of North Carolina. 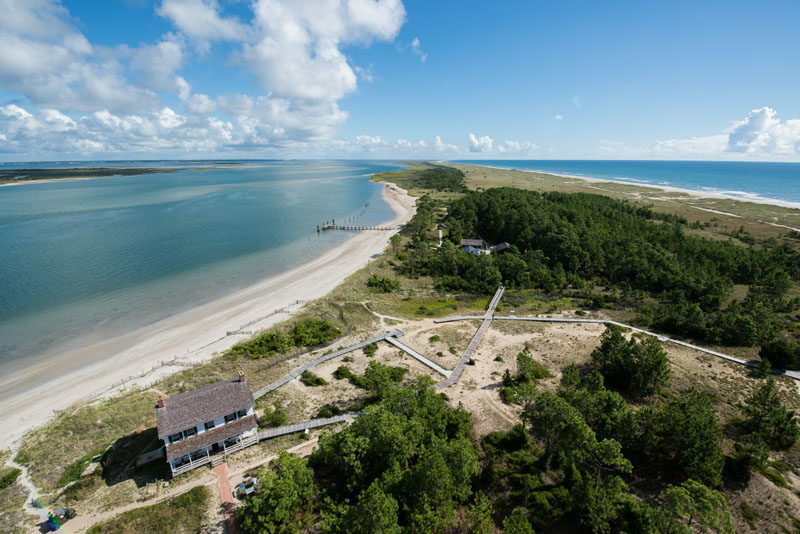 Cape Lookout is located close to Harkers Island and the town of Beaufort, in Carteret County, N.C. When was the Cape Lookout Lighthouse built? The first Cape Lookout Lighthouse was built in 1812, but at 96’ foot tall, it was too short to be effective for mariners travelling through the dangerous offshore Diamond Shoals. The current Cape Lookout Lighthouse was built to replace the original structure, and was officially lit on November 1, 1859. How much did it cost to build the Cape Lookout Lighthouse? The current Cape Lookout Lighthouse costs $45,000 to build, which was approved by the U.S. Congress in 1857. 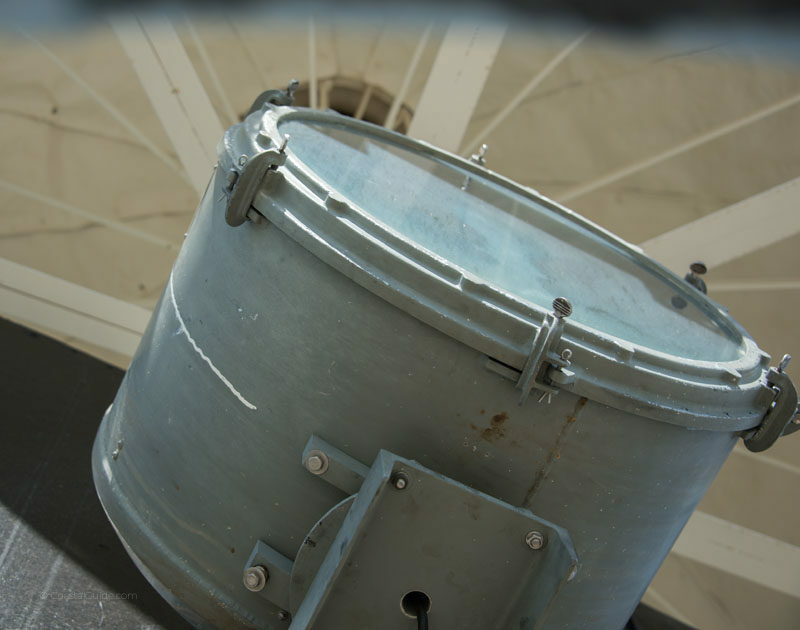 How many steps are in the Cape Lookout Lighthouse? 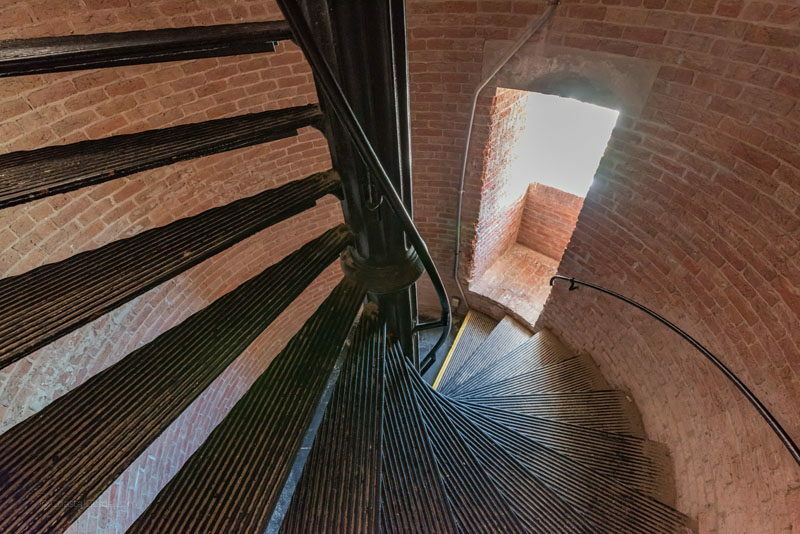 There are 207 steps from the base to the gallery top of the Cape Lookout Lighthouse, which is approximately equal to climbing a 12-story building. How do you get to the Cape Lookout Lighthouse? The only way to get to the Cape Lookout Lighthouse is by a personal watercraft or ferry. Passenger ferries are available from the communities of Harkers Island and Beaufort, while small vehicular ferries are available from the town of Davis in mainland Carteret County. Can you drive to the Cape Lookout Lighthouse? There is no way to drive to the Cape Lookout Lighthouse, due to its locale on the barrier island shoreline of the Cape Lookout National Seashore. A ferry or private watercraft is required to reach the Cape Lookout Lighthouse. Do you need a ferry reservation to get to the Cape Lookout Lighthouse? A ferry reservation is recommended to access the Cape Lookout Lighthouse. Several privately-run passenger and vehicular ferries access the Cape Lookout Lighthouse, and depart from the communities of Harkers Island, Beaufort, and Davis. How do you get a ferry reservation to see the Cape Lookout Lighthouse? Visitors can call the private ferry company directly to make a reservation to visit the Cape Lookout Lighthouse and the Cape Lookout National Seashore. Several ferry providers, like Island Express Ferry Service, also allow online reservations. Where are the ferries that access the Cape Lookout Lighthouse? Ferries that access the Cape Lookout Lighthouse depart from several locations along the Crystal Coast, Including the towns of Beaufort, Davis, and Harkers Island. How do you get from the ferry to the Cape Lookout Lighthouse? 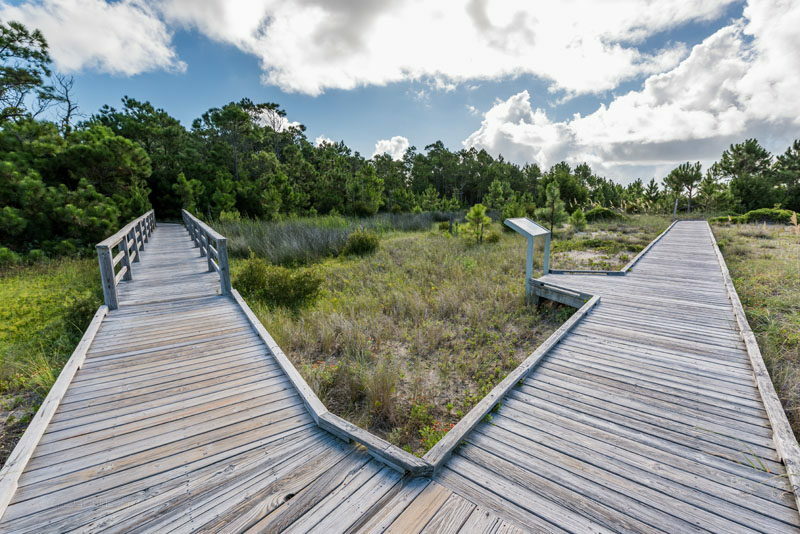 Depending on the individual ferry provider, there is a short boardwalk that leads from the most popular ferry docks to the Cape Lookout Lighthouse. 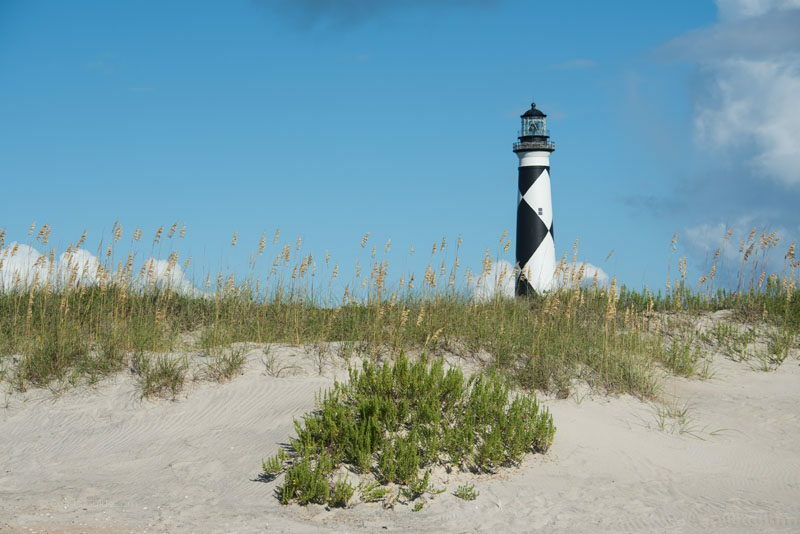 Can you take a personal boat or watercraft to visit the Cape Lookout Lighthouse? 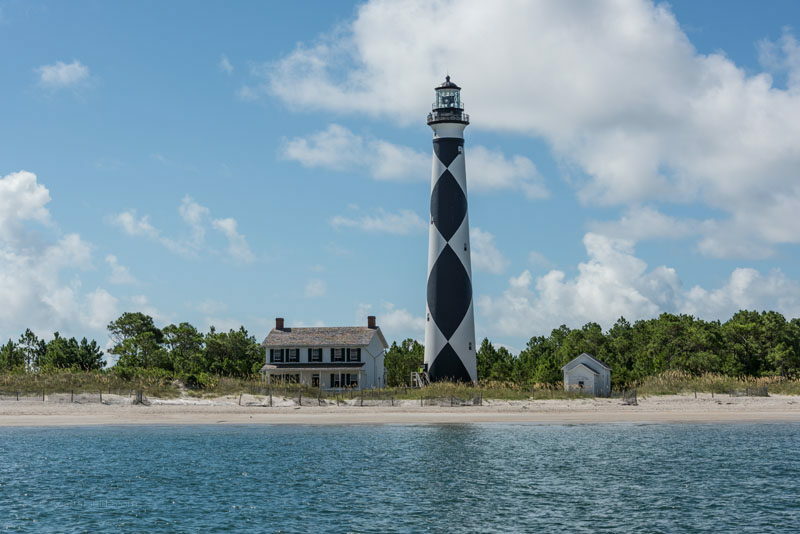 Visitors can take their own boat to the Cape Lookout Lighthouse. Limited docking is available at several spots within the Cape Lookout National Seashore. Are pets allowed on the ferry to the Cape Lookout Lighthouse? Some of the ferries that provide transportation to the Cape Lookout Lighthouse do allow pets. Visitors will want to call the ferry provider first to confirm if pets are allowed on board. When do the ferries run to the Cape Lookout Lighthouse? Ferries to the Cape Lookout Lighthouse generally operate from April through November, although some may provide off-season crossings. During the summer months, most ferry providers run daily, with multiple crossings per day. Can you climb the Cape Lookout Lighthouse? The Cape Lookout Lighthouse is seasonally open for climbing, generally from mid-May until Mid-September. When can you climb the Cape Lookout Lighthouse? The Cape Lookout Lighthouse is open for visitors from about the middle of May until the middle of September, and from roughly 10:15 a.m. until 4 p.m. During the season, the Cape Lookout Lighthouse is typically open for climbing Wednesday through Sunday, and is closed on Mondays and Tuesdays. Does it cost money to climb the Cape Lookout Lighthouse? There is a small fee to climb the Cape Lookout Lighthouse, which is around $8 for adults, and $4 for children and seniors 62-years-old and over. Why is the Cape Lookout Lighthouse important? 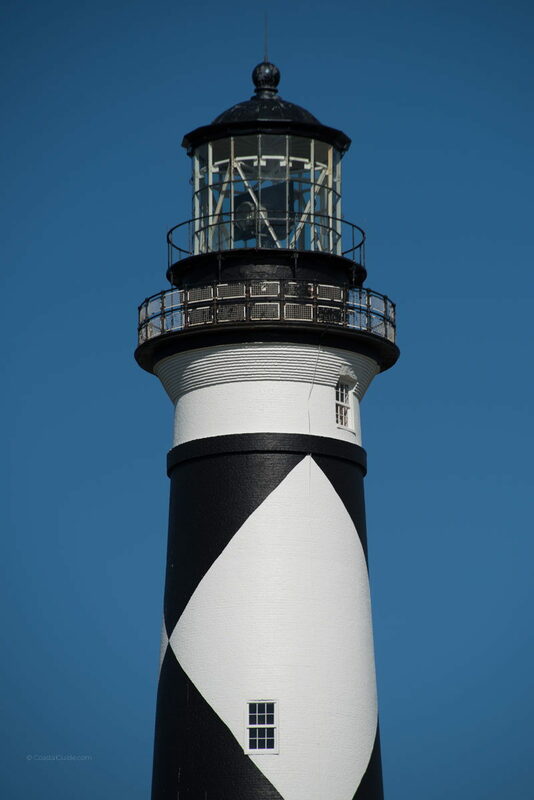 The Cape Lookout Lighthouse is the southernmost lighthouse on the Outer Banks, and is also one of the most distinctive of the OBX lighthouses due to its black and white diamond pattern. It’s also well known as one of the most difficult to get to, simply because of its location along the Cape Lookout National Seashore, which is only accessible by personal watercraft or ferry. Who owns the Cape Lookout Lighthouse? The Cape Lookout Lighthouse is owned and operated by the National Park Service, and is part of the Cape Lookout National Seashore. Where can you stay near the Cape Lookout Lighthouse? 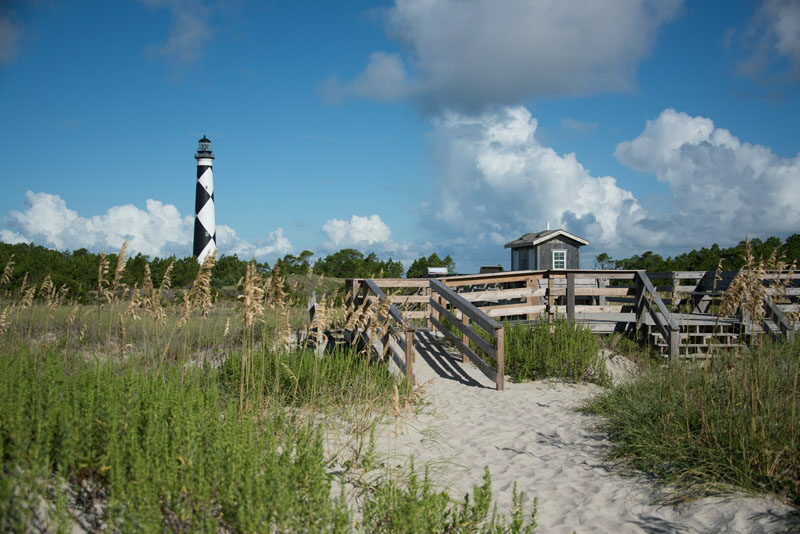 There are a small number of cabins that are available to rent close to the Cape Lookout Lighthouse, and which are managed by the National Park Service. On the mainland, accommodations are available close to the ferries that access the Cape Lookout Lighthouse in the communities of Beaufort and Harkers Island. Are there tours of the Cape Lookout Lighthouse? Small group climbs of the Cape Lookout Lighthouse are held throughout the day in the summer months, from Wednesday through Saturday. Each scheduled climb to the top can accommodate 10 people. Do I need reservations to climb the Cape Lookout Lighthouse? Reservations are not required to climb the Cape Lookout Lighthouse, however, visitors must first purchase a ticket at the Light Station Visitor Center, which is located at the base of the lighthouse. 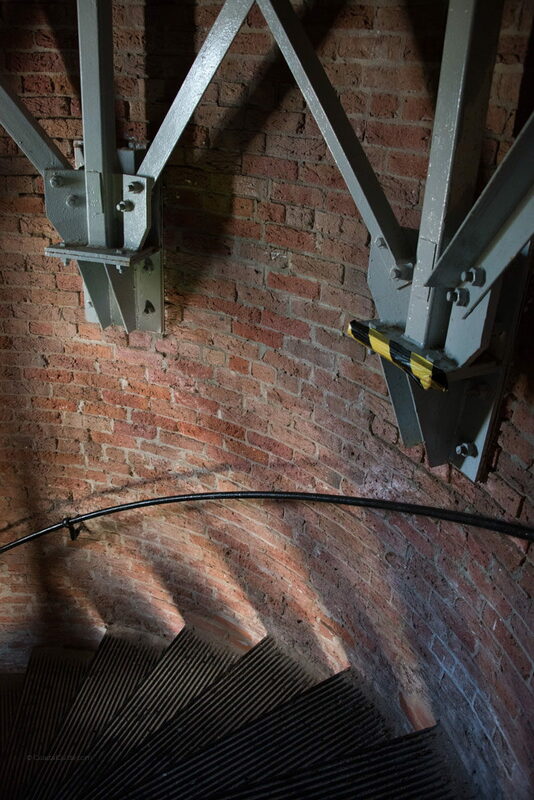 Tickets are sold on a first come / first served basis, and ticket holders should arrive at the lighthouse at least 10 minutes before their scheduled climb. Can kids climb the Cape Lookout Lighthouse? Children may climb the Cape Lookout Lighthouse, however all children must be at least 44 inches tall to make the climb, and all children who are 12-years-old or younger must be accompanied by an adult. 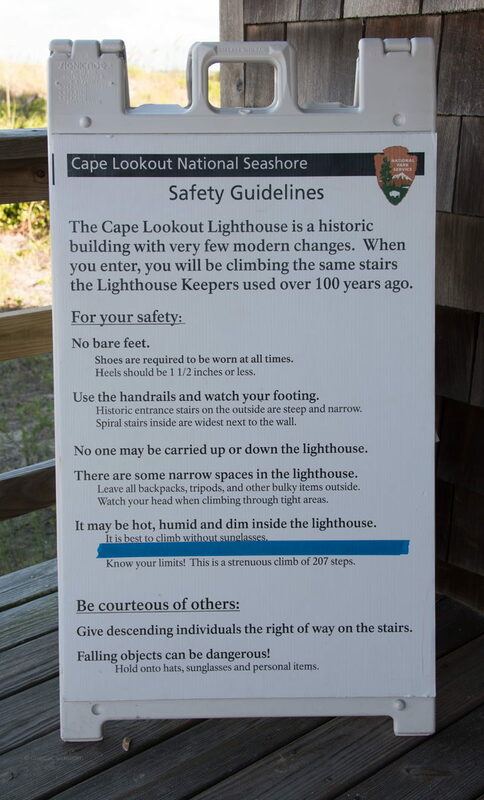 Can I wear flip flops or sandals to climb the Cape Lookout Lighthouse? Shoes are required to climb the Cape Lookout Lighthouse. Flip flops are not recommended, and heels should be less than ½ inch for safety. How tall is the Cape Lookout Lighthouse? The Cape Lookout Lighthouse is 163’ feet tall. Is the Cape Lookout Lighthouse lit? The Cape Lookout Lighthouse is lit year-round, and is one of the few lighthouses in the country that operates during the day, as well as during the night. How often is the light rotation at the Cape Lookout Lighthouse? The light within the Cape Lookout Lighthouse flashes every 15 seconds. How far away can you see the Cape Lookout Lighthouse light? The light of the Cape Lookout Lighthouse can be viewed from up to 19 nautical miles away, depending on weather conditions. What kind of light does the Cape Lookout Lighthouse have? Is there a Cape Lookout Lighthouse museum? The Cape Lookout Lighthouse does have a Light Station Visitor Center, which features a number of attractions and amenities including a Shells of the Seashore exhibit, a number of informational materials, seasonal programs, free Junior Ranger and Junior Ranger Adventures booklets, and a small bookstore. Is there food available near the Cape Lookout Lighthouse? There are no concessions, vending machines, or food available once on the isolated Cape Lookout National Seashore, so visitors will want to bring along snacks and drinks. Are there drinks available near the Cape Lookout Lighthouse? There is a water fountain available near the Cape Lookout Lighthouse, however, there are no vending machines or other drink or snack vendors on the isolated seashore. Are there restrooms near the Cape Lookout Lighthouse? There are restrooms available near the Cape Lookout Lighthouse, next to the Light Station Visitors Center. 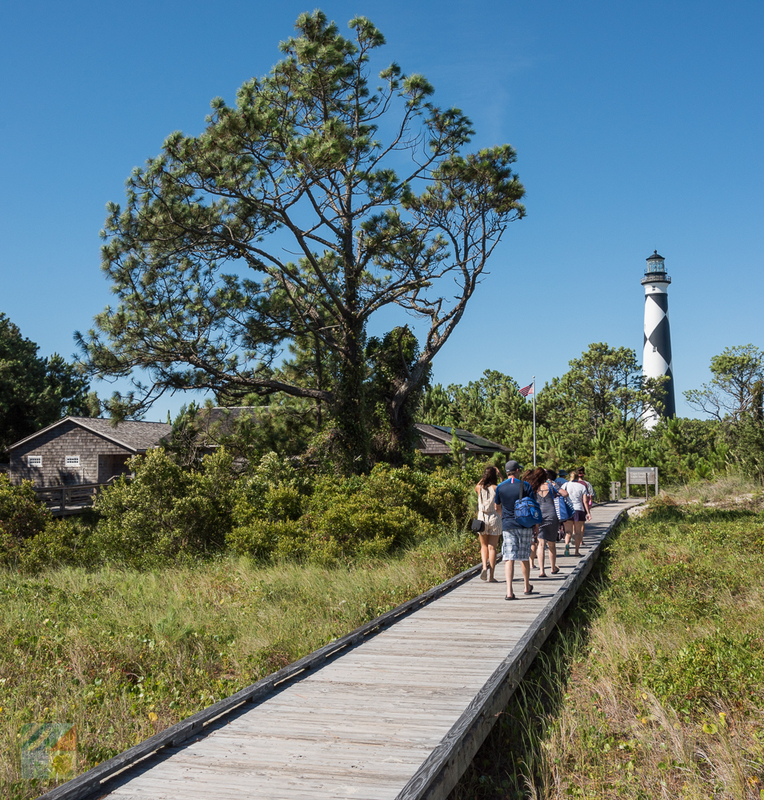 What are the attractions near the Cape Lookout Lighthouse? 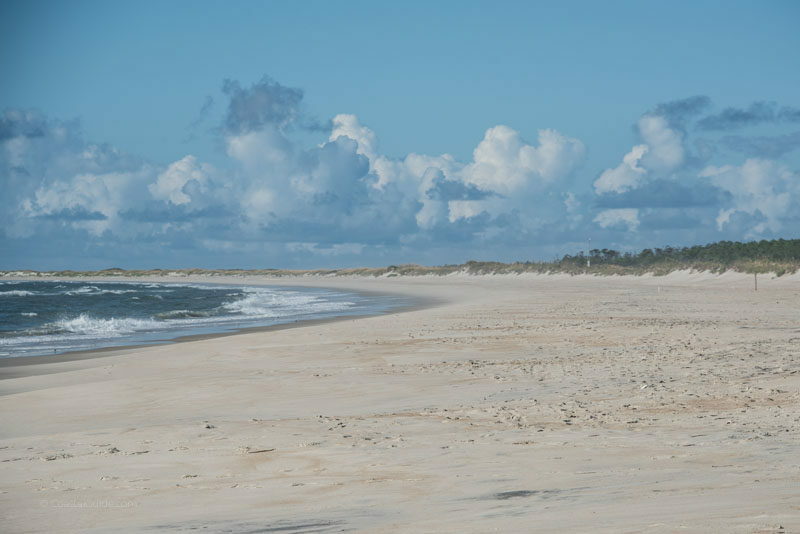 As part of the isolated and undeveloped Cape Lookout National Seashore, the Cape Lookout Lighthouse is close to miles of pristine beaches which are known for exceptional fishing, birdwatching, shelling, boating, and other seashore activities. Does the Cape Lookout Lighthouse have a gift shop? A small gift shop is located at the Light Station Visitor Center, which is situated next to the Cape Lookout Lighthouse. 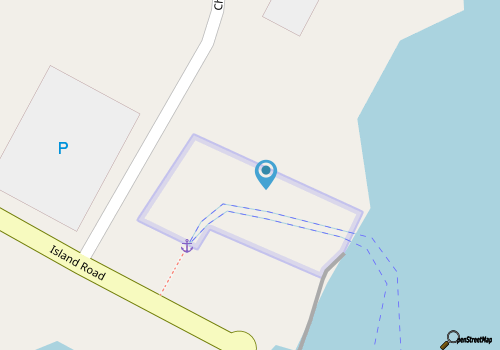 Are there shells near the Cape Lookout Lighthouse? 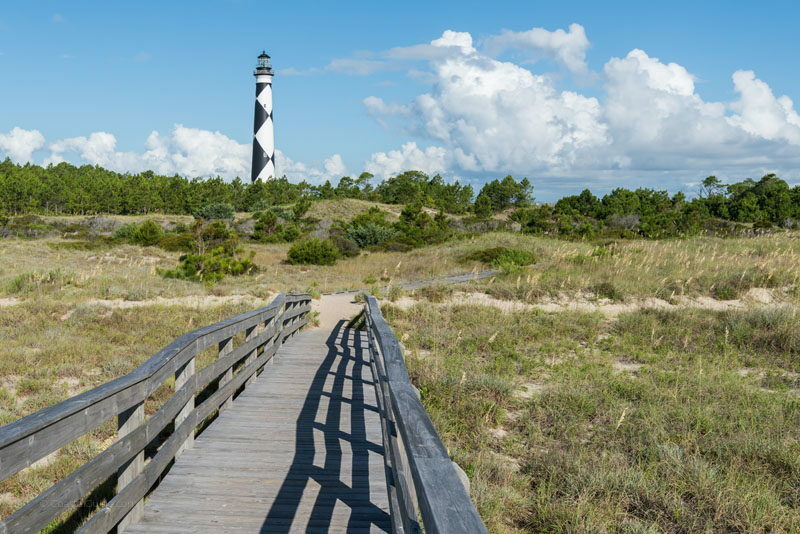 The Cape Lookout National Seashore is well known for its isolated beaches and great shells, and the Cape Lookout Lighthouse is a just stroll away from the local ocean-facing shoreline.